Prime Minister Narendra Modi on Tuesday wooed thousands of farmers at a massive BJP rally in poll-bound Karnataka by promising them "acche din" (good days) if his party is voted to power in the upcoming assembly polls, and attacked the ruling Congress government for failing to serve the people. "I appeal to you all to bless the BJP to form the next government under the leadership of B.S. 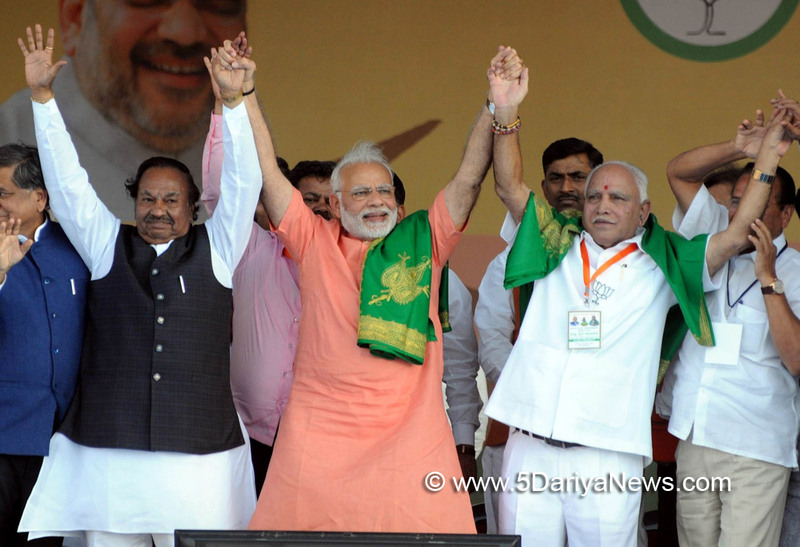 Yeddyurappa, who is a farmer's son, by voting for the party in the upcoming assembly election," said Modi at the rally in this textile town, about 260 km northwest of Bengaluru.The rally also marked the 75th birthday of the Bharatiya Janata Party (BJP)'s chief ministerial candidate Yeddyurappa, who is also the party's state president and a Lok Sabha member from Shivamogga, about 300 km northwest of Bengaluru. "Election after election (in different states), people are removing Congress from power. People of Karnataka, too, are angry and keen to oust Congress for its misdeeds," Modi said.There is an anti-Congress mood in the state and contempt for its leaders, he said.Modi began his 30-minute speech in Kannada, evoking loud cheers and later switched to chaste Hindi. The Congress party never cared for the poor and the farmers, Modi remarked, while hailing Yeddyurappa as the "farmers' friend". "One family ruled India for 48 years (referring to Congress), but never cared for the poor, whereas one tea seller (referring to himself) served for about 48 months, and has devoted all his time to the poor and farmers," he said.The BJP-led National Democratic Alliance (NDA) government has unveiled several pro-farmer schemes, including a minimum support price (MSP), which was announced in the 2018-19 Union Budget to be 1.5 times the production cost, Modi said. "We have pledged to double farmers' income by 2022, when India celebrates 75 years of Independence," he asserted.This was Modi's third rally in the southern state after the second rally at Mysuru on February 19 and the first in Bengaluru on February 4.The 15th assembly polls are due in the state in late April-May.The BJP came to power in Karnataka on its own for the first time in 2008 but lost to the ruling Congress after five years in the May 2013 assembly election.Yeddyurappa was the party's first Chief Minister of Karnataka from May 2008 to July 2011 when he resigned following his indictment in the multi-crore mining scam in the state during his three-year tenure.